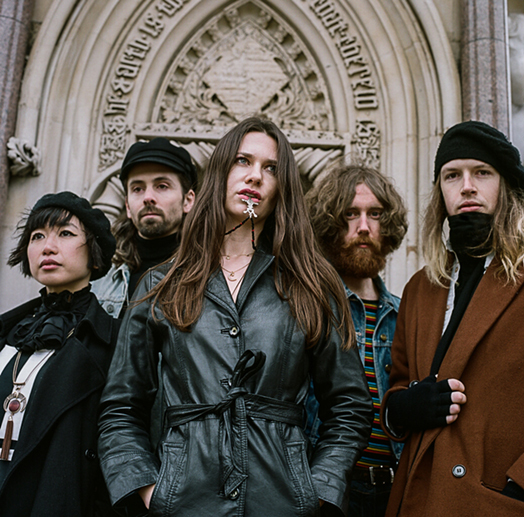 Josefin Öhrn + The Liberation release their third album for Rocket Recordings 'Sacred Dreams' on 26 April. Here is the immersive video for recently released single 'Feel The Sun'. ‘Feel The Sun’ invites you into the bands very own dimensional soundscape, a world built with transcendental guitars, driving grooves and otherworldly, enchanting vocals, altogether seeped in layers of blissfully produced synths. Lauren Laverne said on her BBC 6 Music show the track was her "favourite new single". The video for ‘Feel The Sun’ was created by the motion graphics studio Grizzle. And what the team of four designers created is not only a visually stunning experience but also uses revolutionary software in a way not yet seen in a music video, with state-of-the-art manipulation of 3D design and an extra layer of hand-drawn illustration. Every single aspect of the song, every stem of recording, was used to create a rhythmic journey through this Tron-esque dystopian retrofuture. Objects and landscapes glow and pulse together in digital harmony driven by the amplitude of these sounds. 'Sacred Dreams' is available in several different formats. We have sold out of the special 'Yellow & Black Colour In Colour' vinyl but you can buy direct from the band on their up-and-coming tour – or there is also a ltd 'Indie Exclusive Blue/Black Swirl' version, and a ltd 'Orange' vinyl version, both will be available from your local record shop.